Oh.my.goodness! Where has 2013 gone already? I can’t believe January is almost up. Goals are attainable in nature. If your goals aren’t attainable, you need to rethink your goal making process. Rather than making a resolution to lose weight (how vague is that??) you should make a goal to watch what you eat to implement healthier foods and start a workout plan. Boom. Instantly more attainable. Now, someone out there is probably wondering why I am blogging about resolutions & goals now — we’re almost through January for pete’s sake! Well, I won’t lie to you, I just made my goals for the year today. Yep, today. So if you never made your goals for the new year, never fail! There is still time! I also excluded December. I need some time off! Of the 10 months remaining, these topics are things I want to focus my life on a bit. 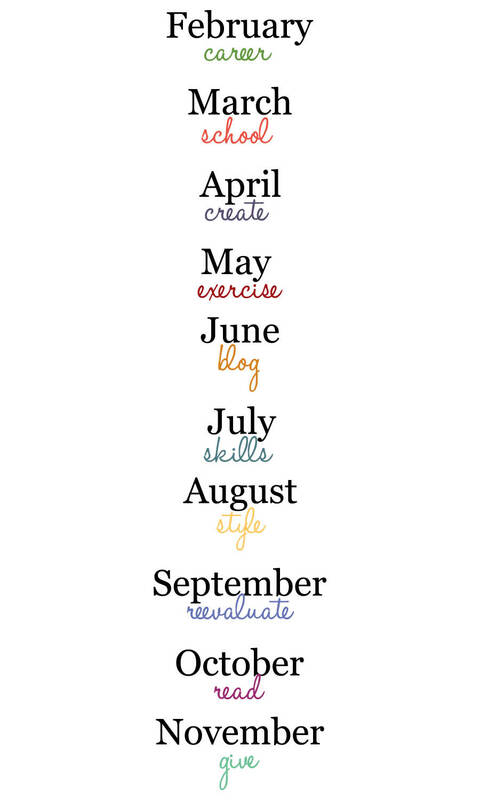 Even if I only make small progress towards each of these topics during the month, it’s a start. Just because I’ve assigned each one to a month doesn’t mean I won’t contribute something to it at a different time; i.e. I’m not going to stop blogging until June and only blog during the month of June. I also have an ongoing list of smaller goals like cleaning out my email inbox every Sunday night. I’ll be tracking my progress every so often & I hope that when December rolls around I will have accomplished some goals! If you haven’t made your ‘resolutions’ or goals yet — now is the time! Consider this your opportunity! p.s. I’m head-over-heels in love with Carly’s business card method!